It’s Olficial! I killed it! 4 years faithful service. Thankfully not my sewing machine, but a severely scored cutting mat with a vertical great big open hole. 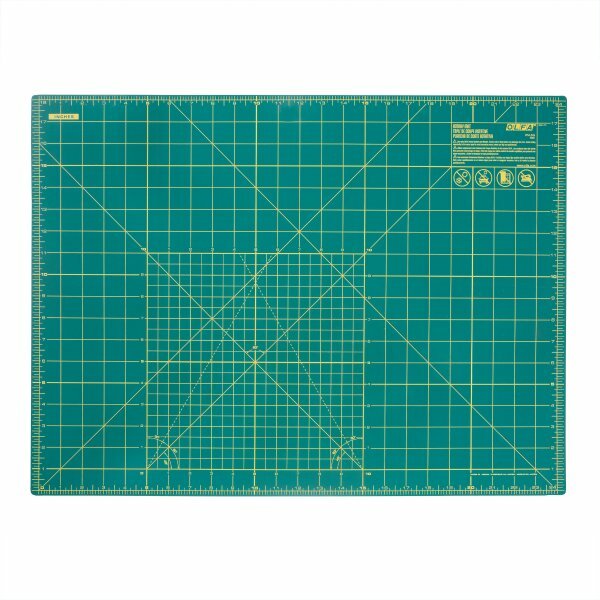 RIP my 60 x 45cm (24 x 18″) OLFA green rotary cutting mat. So sorry you cracked under the strain, but I suppose our break up was somewhat inevitable, given our passion for each other. You OLFA were amazing, so many hours shared, tears, tantrums, and sometimes wine spilled over you. We always cut on our favourite line, didn’t we, which I didn’t need my glasses on for all the time. OK …. No manicure and rubbish nails so this looked more presentable! I really don’t mean to be scary! So many quilts, so many stories spanning the globe, humanity, friends, family and strangers. But then I broke you, right down our favourite cutting line & I am so sorry. 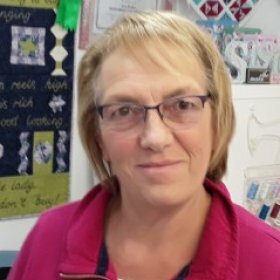 Was it really my fault for buying extra sharp titanium blades for my OLFA cutter, was it my fault for giving you a lend to friends at sewing retreats, was it my fault for doing so much cutting for my quilting, and always using the same 15” cutting line at the edge of the 10” square? Probably … our break up had to happen one day but I’m still devastated. 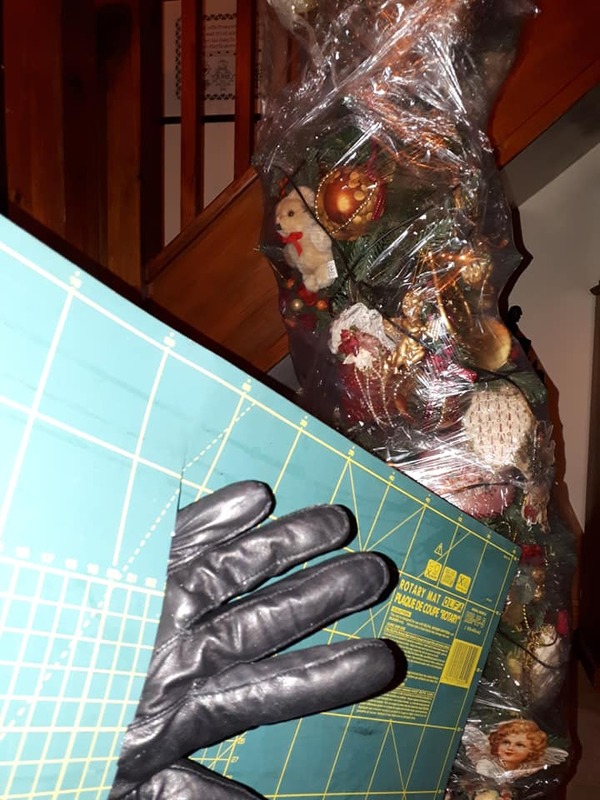 Oh OK, freaky shrink wrapped Christmas tree and sinister fake leather thinsulate lined gloves. This picture is far better than the wrinkled 61 yr old hands trying to hold the board, while shoving her un-gloved hand through the hole & using a phone only my 4 yr old grandson’s understands to take selfie’s! Trust me! Yes OK all my fault, but you are not going in the bin. I am going to try to cut you up again into a mini cutting mat to go on the top of my Horn sewing cabinet, with a wool pad pressing surface on the other side, so all is not yet lost, and yes I will of course be replacing you with a new younger same brand model. 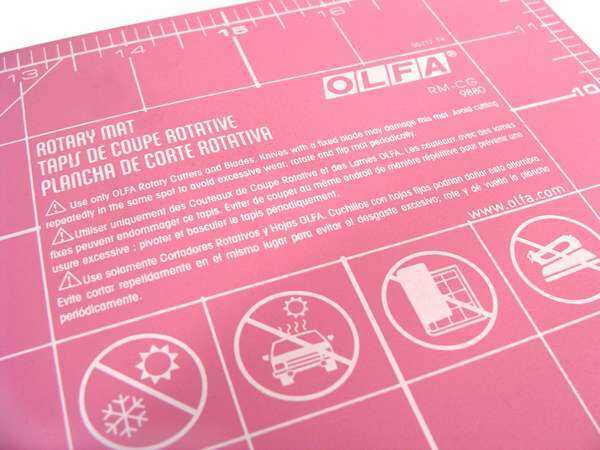 The green Olfa cutting mat replacement is now ordered & I fell in love with the pink one too. 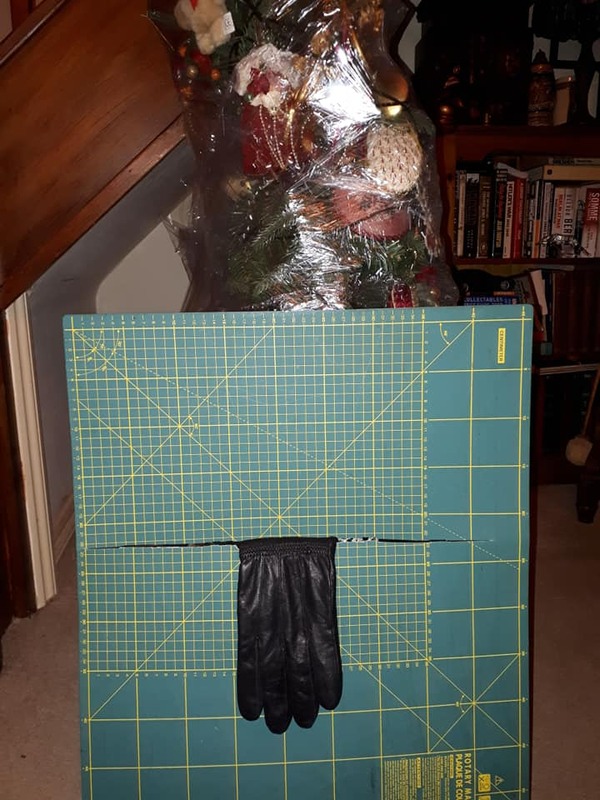 As an emergency stop gap I bought the most expensive 24 x 18″ mat in stock from a well known large retail crafting store, (other stores are available). My personal advice is don’t do it, not even in an emergency. You will live to regret it! It has lasted just a week, the ruts where I have been cutting up just 8 Moda Scrap bags are already snagging & dragging my OLFA rotary cutter with newly changed titanium blades & insisting on me doing 4 cuts just to get through only 4 layers of fabric, even though I cut on a different line each time. It does not self heal, although it is thicker, very hard & it looks heavy duty. 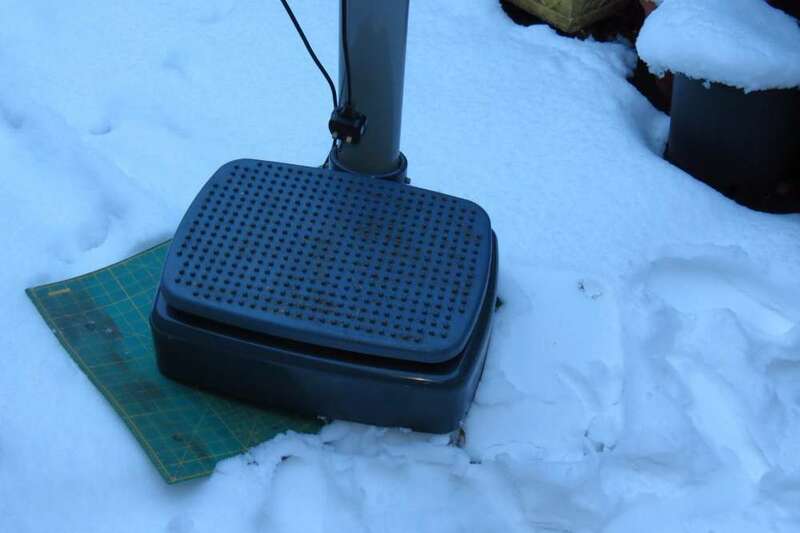 It is less bendy & flexible than the OLFA mat, but in my opinion it is a rather “Naff Mat”! I can “Quilt in the Ditch”, I did not expect to cutting in one after only a week! Printed directions on this mat, made in Tawain, say …..”Cut in different positions to extend the life of the mat”. Okie Dokie, I think I have got that! Position 1) I will kneel with my bottom on my feet & after doing lots of cutting, then fall over when I get up, because my feet have gone to sleep & legs have gone like flippy floppy rubber. Thanks for that one! Position 2) I can sit on bad left hip on the floor, with knees & legs neatly folded to my right, using right arm to cut, that works for a while but hurts, and I need a forklift truck, or husband to resume a vaguely vertical position. Position 3) I sit on good right hip with legs to my left, cutting with my right arm. Well that one didn’t work at all, as I faceplanted the cutting mat when I toppled over because I was completely off balance! Sitting on right hip and using right hand does not work! Position 4) Stand up and lean. Sadly untenable as standing for more than a few minutes even over a beautiful Jumbo OLFA mat on my Horn table won’t work. I’m too old and knackered & sitting doesn’t improve it because I can lean far enough forward to do long cuts, so sitting on the floor works most of the time. So dear “non” OLFA manufacturing company …. were you referring to Crunching Tiger or Collapsed Downward Canine, (other Yoga positions for ladies of a certain age I am sure are available), or just telling me to cut Wonky, ignoring any measuring line whatsoever on your mat for a bit, before my new OLFA ones arrive! That should give me another day or two. Brilliant! Instructions also tell me “Do not roll”, well as I haven’t been down the gym in decades to be able to even bend your extremely stiff mat, let alone roll it, un-necessary warning! The only “rolling” I do these days is out of bed, or off the sofa, or pancakes. I will remember that warning notice though just in case. Last instruction is completely fabulous “Keep out of direct sunlight and heat”. It’s winter and I live in a old and extremely cold 1870 damp beamed cottage. I sew in the garden in the summer for sun & daylight! 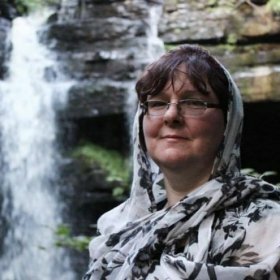 OLFA never minded me sitting on the floor in front of my log fire with her on the carpet cutting out quilting loveliness. I suggest that “emergency cutting mat”, that you seriously don’t like me, but maybe not quite as much as I seriously “unlike” you. Such a shame you don’t have a Facebook page, so that we could become friends & then I could ceremoniously dump you on purpose, because you upset me. Me, Moi? Older grumpy quilter! Hell yes …….. Damm right! OH MY …. Not Remotely invented, because even my bonkers brain under triple ice cream freeze with salted caramel sauce & added sprinkles, could have ever dreamed this one up! The Goddess of Irony is just sublimely wonderful, and obviously peaks to all her powers on a freezing Friday! She plops a potential verbal expletive bomb right in your lap when least wanted, but obviously to be expected, given my track record! I was overjoyed at 9am, destroyed by Noon when the 2nd delivery came! Nooooooooooo…. Both OLFA, but both Green, What part of “Pink” didn’t the bar code tell you? I now have to do an Agatha Christy on both boxes, but given where I live that rather nice Father Brown, or the Detective from Midsomer Murders off the TV might be filming round here, so they might be quicker than me trying to find my glasses! Which one of you did not pack the “Pink”, and which one didn’t get it wrong. No packing note, far too obvious, lets just work on the boxes shall we? Plan B just order another pink one and keep my fingers crossed, as it is too much hassle to send the other one back. However there was life in the old girl yet, the mat that is! I am enduring “Man Packing” at the moment as husband is going skiing for a week, incurring lots of thumps & bumps on the floor upstairs. I am avoiding upstairs unless I need the loo. Because he only booked it a week ago, I am now best friends with the Amazon delivery man, several times a day to be honest. He has bought everything from silk gloves to line ski gloves to knee supports, ultra sun scream, lip balm, ski socks, wickable/breathable unmentionables, base layers lined with spacesuit tested fabric. 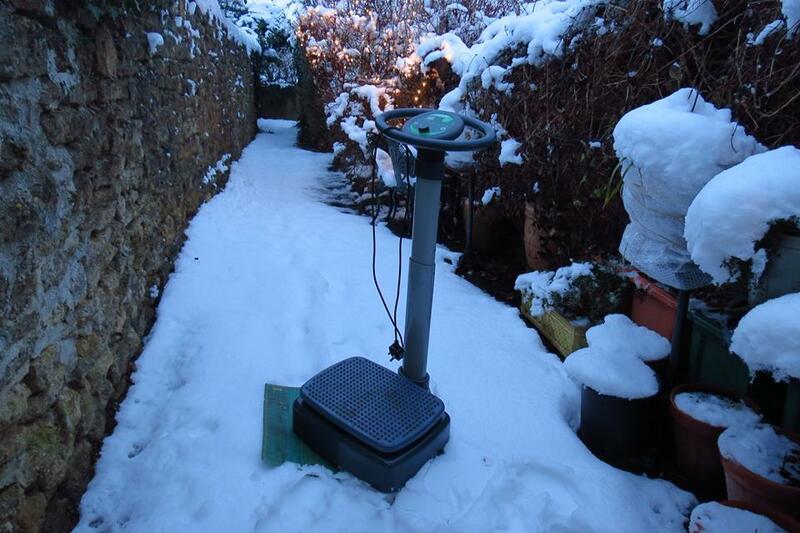 Back to Olfa, my husband decided he wasn’t fit, so dragged my old exercise vibration plate machine, covered in mould and cobwebs, out of the shed, to do leg lunges. I need to put it on something he said. For once even my quilting stuff came in handy! The dead Olfa Mat! We had Snow-Armageddon, but thankfully he did make it to the airport, to do boy stuff in Austria with feet strapped to planks of wood. Quick Tip, get more sewing time before and after Christmas. Shrink wrap your Christmas tree complete with lights and baubles and dingle dangles. I did it last year as a joke, and yes with 2 black bin liners also securely wrapped and taped over it, it did look like a bit like a dead body in the shed….. BUT this year putting up the tree was a 5 minute doddle, from shed to dining room. “Ta Da”! Snip and fluff it out was all it took. 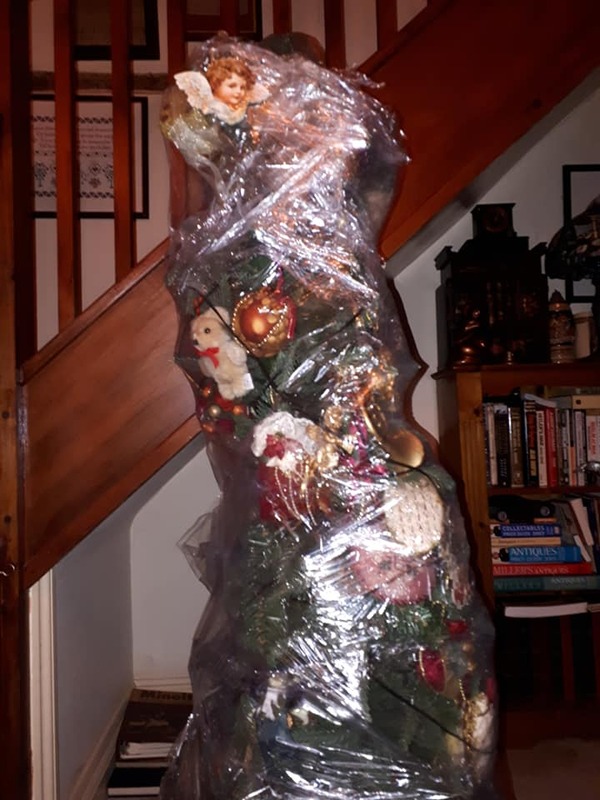 Tree now shrink wrapped for next Christmas. I can highly recommend this lazy time-saving tip! Shed or Loft it, SORTED! Brilliant! Had me laughing out loud – and getting odd looks from the dog!